Thanks to the launch of a number of commercial and unclassified earth observation and sensor satellites over the last few years, coupled with the advancement of software and data analytics to work with the data they collect, the use of space-based surveillance platforms has been increasing significantly in maritime domain awareness applications. There are now numerous examples of how this data has been beneficial in areas such as fisheries compliance, Illegal, Unreported, and Unregulated (IUU) fishing monitoring, environmental monitoring, sanctions compliance, counter piracy operations and a host of other global maritime issues. Next week ORBCOMM will be on hand at GEOINT 2015— the largest defense, intelligence and homeland security gathering in the U.S.—to showcase how our satellite AIS data service plays a major role in geospatial maritime surveillance. With our eight AIS-receiver-enabled satellites and 16 Gateway Earth Stations (GES) across the globe, ORBCOMM offers the most comprehensive global AIS service available today. As ORBCOMM gets ready to launch 11 more of its AIS-equipped OG2 satellites later this year, global AIS coverage should improve significantly. Moreover, the ability to correlate satellite AIS data with synthetic aperture radar imagery from an earth observation satellite, in particular, is highly reliant upon having as many satellites and as many passes as possible from AIS satellites in different orbits. This enables proper correlation of radar ‘targets’ with AIS targets and can mean being able to identify vessels that are fishing illegally in another country’s Exclusive Economic Zone. It can also enable identification of a vessel suspected of an oil spill or monitoring environmentally protected areas, such a barrier reefs, for any vessels that may be cutting through restricted areas. Example of bilge dumping off the South African coastline. 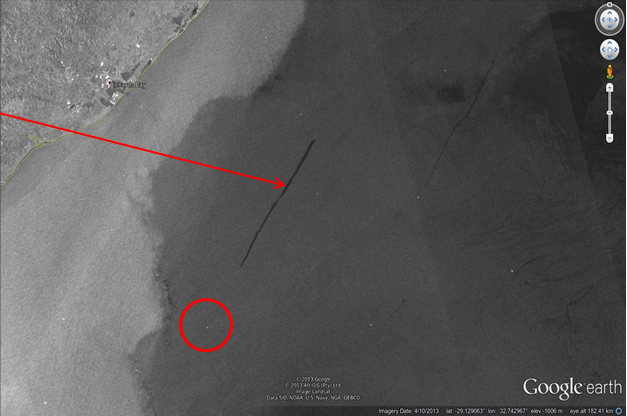 AIS data correlation with satellite imagery enables vessel identification. ORBCOMM works with a broad range of earth observation satellite operators and value added application providers to fuse its global AIS data with other sensor data into advanced geospatial systems. These systems provide meaningful and actionable information to maritime authorities. We look forward to discussing these use cases at GEOINT 2015 in Washington DC next week! Going to be there? Schedule a meeting with us.